The managers of a shopping centre that had to shut because of safety fears over its parking area have been told the entire car park should be rebuilt. 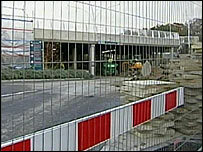 Shops at Bournemouth's Castlepoint closed in December because of fears the car park's concrete was unsafe. Engineers have now advised management "the only sensible way of sorting it [the problem] out is to dismantle and rebuild the structure". A consultation with retailers, the council and other parties is planned. A centre management spokesman said: "It is our firm intention that the centre will continue to trade as normally as possible during any agreed works, that disruption to the local community, retailers, their employees, shoppers and other visitors is minimised as much as possible and that key trading periods such as Christmas and Easter are safeguarded." Castlepoint managers are now waiting for a proposal from its contractor to confirm details of the work it is intending to carry out, but they said its unlikely that any major work will begin until next year. Bournemouth Borough Council said in a statement: "We welcome the fact that the cause of the problem with the car park appears to have been identified, meaning a permanent solution can now be worked up. "We have been assured by Castlepoint management that the temporary propping already undertaken has a lifespan of up to five years." The council said it would continue to work with the centre management to resolve the issues. The £200m centre shut on 1 December without warning, following reports from engineers highlighting health and safety concerns. Contractors worked round the clock to make sure the structure was deemed safe enough for use by installing props throughout the main body of the car park. The car park and centre were only able to partially reopen before Christmas, and the rest of the shops reopened in stages over the next two months.